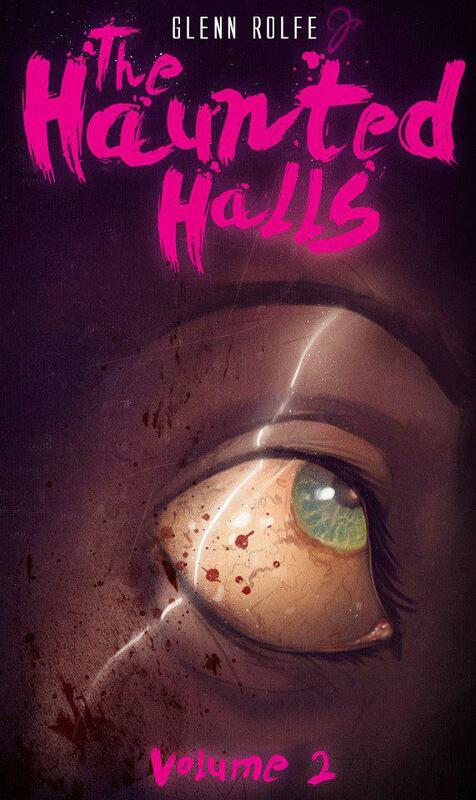 Exclusive: Read the Intro to Glenn Rolfe’s ‘The Haunted Halls: Volume 2’! If you missed the first installment of Glenn Rolfe’s serial novel, The Haunted Halls, do yourself a favor and look into it. It’s a fun read that works to break down a few stereotypes and catch readers completely off guard by flooring the pedal straight out of the gate. The first installment (read about it here) flies by at a ridiculous pace, and if you’ve often found yourself avoiding ghost tales because so many tend to drag, this is probably a piece of work that will have you taking a step in the direction of changing your mind. The man tells a sinister story, and the cutthroat speed in which the first chapter of The Haunted Halls unravels is rather memorable. Glenn Rolfe may not be a household name just yet, but he certainly can be. Rolfe just hit HNR with an exclusive excerpt from the forthcoming follow up chapter of The Haunted Halls. You can look for the latest piece of this ongoing tale to arrive on April 1st! If you’re not yet in the loop, grab Volume 1 and prepare to leap into one seriously unsettling story. Check out the intro below! There is a magic in these haunted halls. I knew the moment I set foot within its confines all those years ago that I could make this place something more. I have been referred to, more in my victim’s thoughts than actually spoken aloud, as the Mermaid, the Dark Haired Devil, the Ice Queen, but somewhere, lost in a pool of sorrow and rage, this lonely young girl who once was known as Sarah -waits. This powerful thing- waits. For those who open themselves up to its glorious crimson charms, to its blood soaked memories, to its spellbound moments of desire- there is a dark promise waiting to be fulfilled. After years of lying dormant, silently preparing, my little tribe of breathing ghosts has finally started to come together. Each one of those I have chosen to bless with my wonderful talents holds within their fragile psyches, their own unique potential. Eric has been a most wonderful surprise- big, strong, and obedient; the ultimate weapon. I feel his rage, his love of death, and his compulsion to please. Watching him immerse himself in his work at my whim is truly invigorating. And then there is poor, poor broken Kenneth; sodomized by a friend of the family, banished to this out of the way inn, left to rot and to remember. Small, lost, frail- I cannot help but find him and his dreams intoxicating. Through my gifts he shall ascend to a level of depravity and usefulness he has never known. The pretty girl, Meghan, so easily possessed; I shall play her, with delicate precision, like the most dark and beautiful of classical pieces- a dramatic Chopin. She too, shall join us…soon. For now, it is sufficient to toy with her, using her loveliness to play with the little overnight clerk, Geoffrey, and his sappy, hopeless romantic reveries. His fun is just beginning. Of course, there is one other I have not yet mentioned, for he is not fully aware of our connection. Oh, our eyes have met, briefly; my presence, already working its way within him. His secrets can hear my whispers, for we speak the same tongue, we dance to the same rhythm, bleed the same song, and share the same vocation. Soon, my sweet Timothy, soon. I have been anticipating this gathering for some time, and would not rush a single, decadent moment. Not now, not when it is all so close at hand. On the contrary, I intend to bathe in every act of wicked defilement, every splattered droplet of blood, and every ounce of pleasure, and pain. Yes, I will wait. My desires remain unbound; as they were in the flesh, so are they now in this death. All will be attainable soon enough- once my path of hellacious wonders is leveled, once this collection is complete, only then shall I truly be free to roam these haunted halls. Before she could rest, Sarah, the Ice Queen, had a few more enchantments to cast.